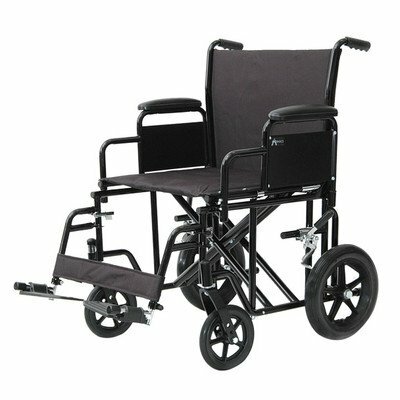 9500 Color: Black Features: -Swingaway footrests with metal footplates.-Removable padded desk arm.-Dual crossbraces.-Double gusseted.-Push to lock rear wheel locks.-Seat belt and safety strap.-12'' flat free rear wheels.-8'' solid front castors.-Seat to floor: 20''.-Weight Capacity: 400 lbs. Construction: -Optional seatbelt features heavy-duty nylon construction and auto-style push button release buckle. Dimensions: -22'' Heavy Duty Transport Chair.-Seat dimensions: 22'' W x 17.5'' D.-Weight: 41 lbs. 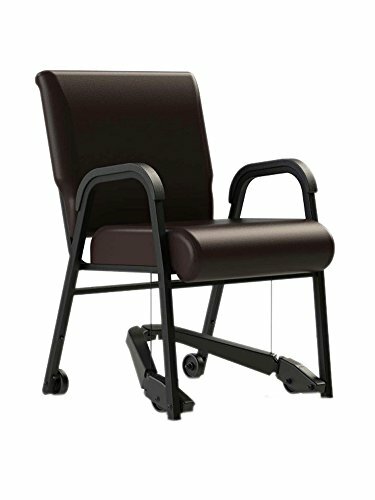 Stylish armed 22" metal chair with the Royal-EZ mobility assist provides caregivers with the ability to easily move an elderly or infirmed seated person. Just press the lever and engage wheels to move a person. So easy even a child can do it! Warranty Provision: 1 year warranty against manufacturer's defects only. 30 day return policy for other than defects, if returned in new condition in original packaging. Under these conditions, a 30% restockng charge will apply. Copyright © Wholesalion.com 2019 - The Best Prices On 22' Bariatric Transport Chair Online.